It’s no surprise that the region containing the oldest town in Colorado is home to some colorful history. The San Luis Valley, nestled between the giant San Juan Range and the rugged Sangre de Cristo Mountains and at the headwaters of the Rio Grande River, has been inhabited for more than 10,000 years by groups that include nomadic hunters, Spanish explorers, homesteaders, prospectors, and farmers. The landscape has also drawn some of the most iconic (and infamous) characters in the canon of the American West—names like Zebulon Pike, John C. Fremont, Kit Carson, Ulysses S. Grant, and Alferd Packer, among many others. The vast expanse of the San Luis Valley, which includes the tallest sand dunes in North America, covers nearly 8,000 square miles, and the Coloradans who inhabit that space have taken great care to preserve its history and culture via the arts. Mission style architecture—including churches, government buildings, and private residences in that seminal style—remains a staple in many towns across the valley. There’s also a vibrant arts scene in many towns, including public markets where local artists sell their wares, along with a string of beautiful public murals. Check out this itinerary to take a tour of the San Luis Valley’s incredible arts scene. 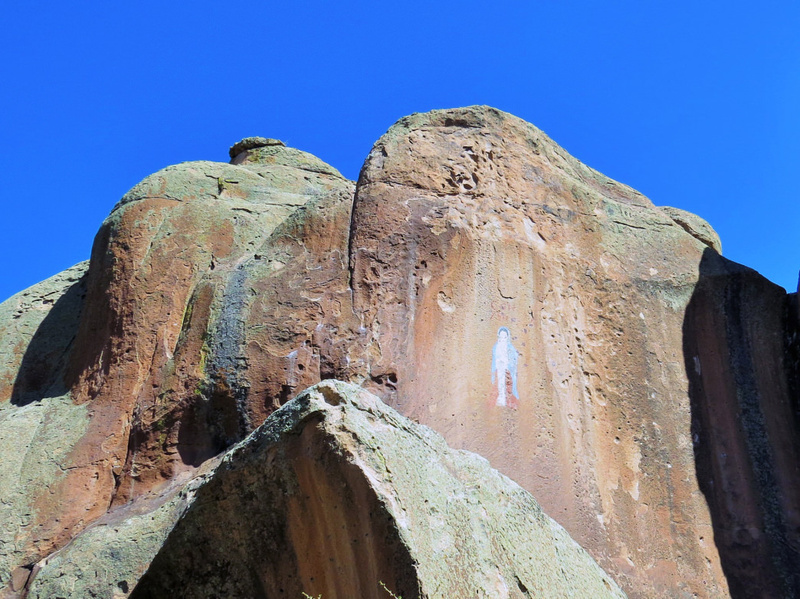 Begin your tour with one of the San Luis Valley’s earliest examples of public art: the blue Madonna at Penitente Canyon. She was painted by Los Hermanos Penitentes, a brotherhood of Catholic monks who once sought refuge beneath in the canyon’s peaceful walls. Sometime around 1937, it’s surmised, some of the brothers suspended a tire from the top of the canyon wall, then painted this likeness of the Virgin Mary while hanging from it in midair. Today, Penitente is popular for sport climbing, mountain biking, and hiking, but it’s also a great place to see some of the valley’s most historical works of art. Next Stop: From the Penitente Canyon Campground, take County Road G for a little under eight miles to US-285. Follow 285 to 6th Street in Alamosa. Take a left onto Hunt Avenue; your next destination is at 4th and Hunt. Your destination is the San Luis Valley Museum in Alamosa, less than a block from the banks of the Rio Grande River. It’s just $2 for admission to the museum for adults (free for students, seniors, and military), but you don’t even have to go into the museum to see your first public mural. In 2013, Adams State University alumnus Ian Wilkinson spent several weeks completing paintings on the side of the museum using the results of a survey meant to gauge residents’ interpretations of San Luis Valley history. The series of paintings depicts the valley’s past, present, and future. Next stop: From the San Luis Valley Museum, head south on US-285 for about 15 miles to La Jara. Local artist Fred Haberlein has painted murals all over the San Luis Valley, depicting the valley’s history, flora and fauna, and culture. Haberlein, who’s known professionally as Lightning Heart, grew up on Conejos Ranch, a guest ranch outside Antonito. A longtime artist and printmaker, he taught art classes at Colorado Mountain College for nearly two decades, and has completed dozens of murals all over the American Southwest, many of which you can find in the San Luis Valley. In La Hara, look for Haberlein’s murals on the U.S. Post Office building, the La Jara Trading Post, the Catholic Church, and the Long Branch Saloon. Next Stop: From La Jara, continue south on US-285 for about seven miles to Manassa. Manassa is best known as the hometown of heavyweight boxing champion Jack Dempsey, also known as the Manassa Mauler. Dempsey isn’t just recognized in the International Boxing Hall of Fame; he’s also memorialized at a museum and public park in Manassa. The Jack Dempsey Museum also features an eight-by-twelve-foot portrait of Dempsey, painted by Haberlein. There’s also a 17-by-50-foot mural called "Dempsey in 1921," which pays homage to early 20th century artist George Bellows, on Manassa’s Main Street. Next stop: From Manassa, continue south on US-285 for about seven miles to Antonito. Just 10 miles north of the New Mexico border, tiny Antonito was founded in 1880 as a stop on the Denver and Rio Grande Railroad. It was, for a time, a sheep herding camp, and it now serves as the northern terminus of the Cumbres and Toltec Scenic Railroad. It’s also known for its many murals, most of them painted by Fred Haberlein. 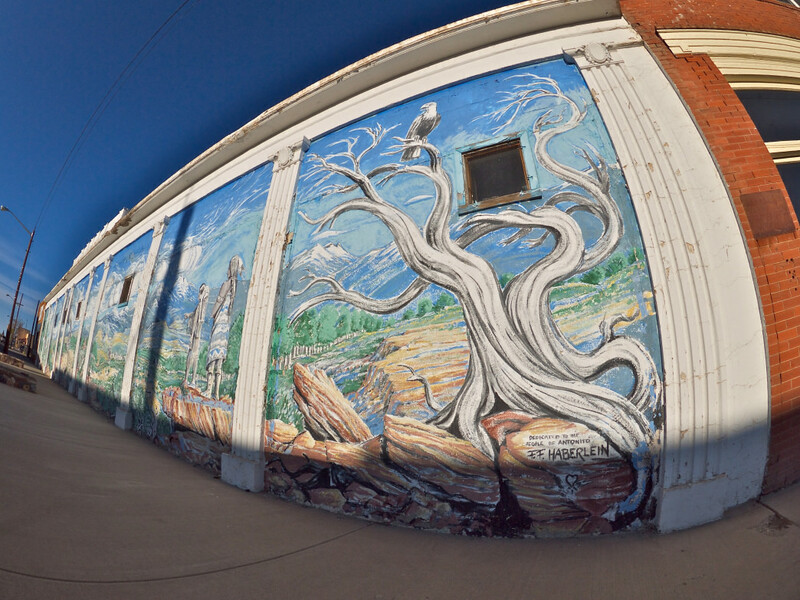 Haberlein’s murals convey many of the key stories in the San Luis Valley’s rich history, including its settlement and its residents’ connection to the scenic landscape. Antonito also retains many of its original historical structures, including its depot and the Palace Hotel. Originally written for Alamosa CVB.